One of the greatest tasks of homebrewing, aside from enjoying your own handcrafted ales and lagers, is combining an array of complementary ingredients to create your own unique beverage. From grains to hops, adjuncts, yeast, and even water, there are innumerable choices out there. When you strike liquid gold with that perfect batch, you want to have all of the ingredients, processes, and peculiarities documented. Assuming a batch a week, this new journal provides handy templates for the brewer to record an entire year of brewing activities. From the name and type right through the bottling day, The Homebrew Journal features blank slates for every critical consideration, including separate grids for grains, hops, adjuncts, yeast, and costs--as well as fields and checkboxes for IBUs, original and final gravity, ABV, water type, and amount; boil temps and durations; measuring instruments and other gear used; pitching temperature; fermentation stages, temperatures, and length; and bottling day processes. In addition, the notebook offers generous space for the brewer to record other significant notes, and appendixes provide handy calculations for things like ABV, attenuation, and alpha acid units as well as explanations of tasting descriptors. 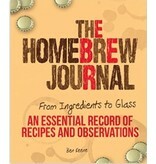 With its lay-flat binding and laminated boards, The Homebrew Journal is sure to hold up for an entire year of sessions on kitchen counters, workbenches, and picnic tables. 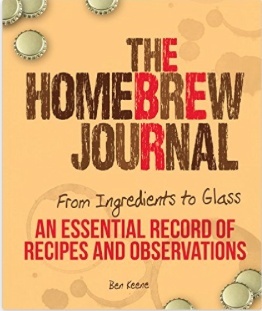 Whether extract, partial-mash, or all-grain brewing is your passion, this is the most functional and user-friendly journal you'll find.